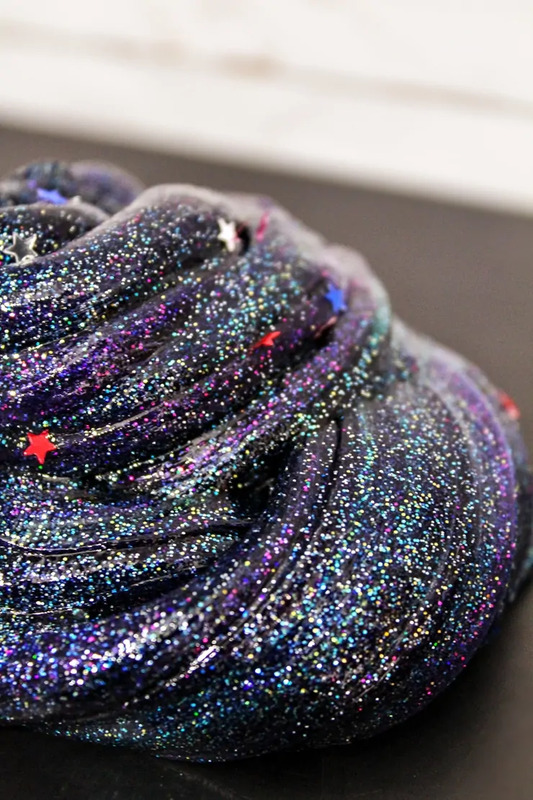 Learn how to make galaxy slime with this easy galaxy slime recipe. 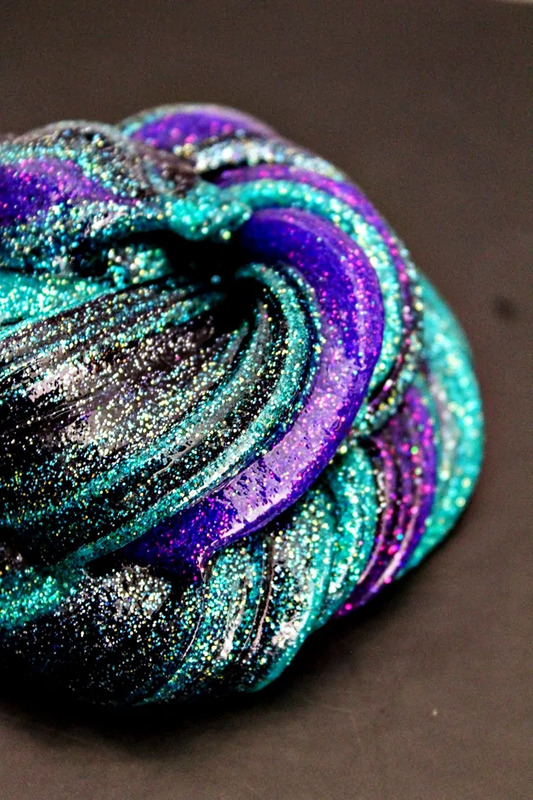 The dark colors and glitter combine for DIY slime that is truly out of this world! 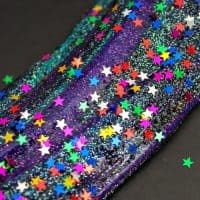 What is it about galaxy crafts and DIYs that are so cool? I think that part of it is simply how exciting, mysterious, and beautiful the galaxy really is. Today I have an absolutely awesome DIY galaxy slime recipe to share with you. While you may print out the instructions and buy the supplies for with your kids in mind, you are going to want in on the action too. It is just so beautiful! 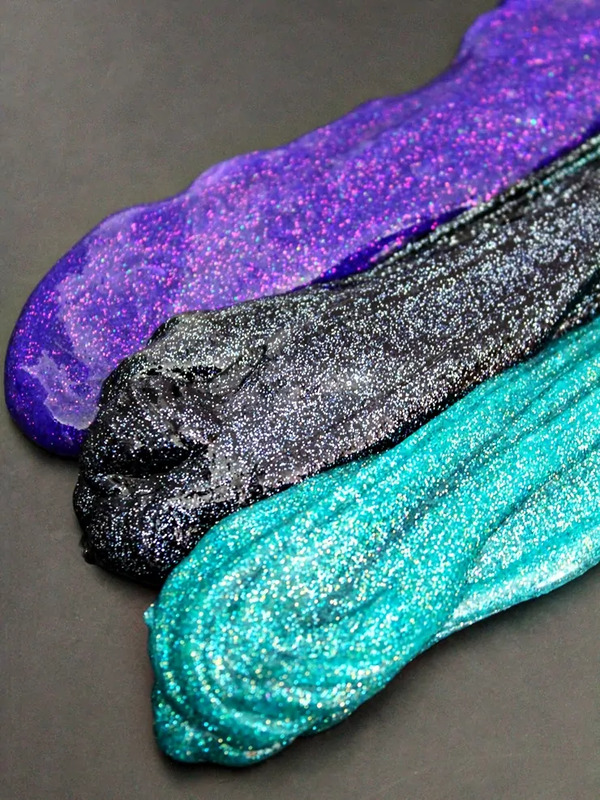 Since this slime is a combination of multiple colors of slime and glitter, you will notice that you basically need to make 3 seperate slimes, then combine them together at the end. Start by gathering all the ingredients and supplies that you will need to make your slime. You will also need 3 medium-size bowls/containers as well as 3 spoons/spatulas to use to mix each color of slime. Black glittery slime is up first. 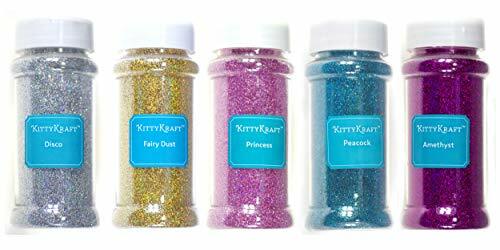 Combine the bottle og black glitter glue, 1/2 a cup of water, and 1/2 a tsp of baking soda. Stir well to combine. Add 1 tbsp saline solution and mix. You will see the slime instantly begin to form. It will be super sticky but as you continue to mix and then knead the slime with your hands. Continue to knead until it is no longer sticky, then set aside while you move on to the next color. Once the black slime is complete, it is time to start making the purple glittery slime. Combine a bottle of clear glue, 1/2 a cup of water, purple food coloring, and pink and purple glitter. Stir well to combine. 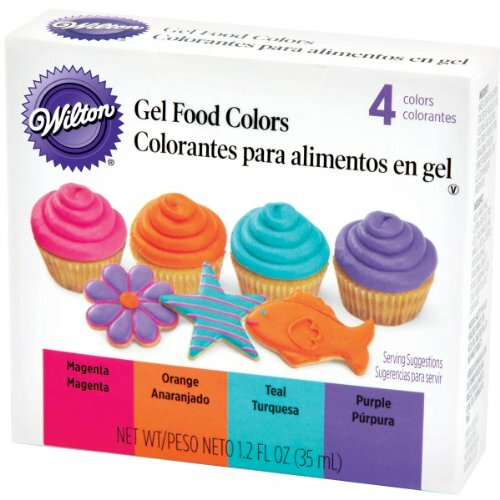 Add more food coloring as necessary to reach the desired shade of purple. Don't be shy when it comes to adding glitter. You really want to dump that glitter on in there, as you can see we did in the image above. Add 1/2 baking soda and stir well. Now add 1 tbsp saline solution, mixing well and then kneading with your hands until it is now longer sticky. Set the purple slime aside while you prepare the last color slime — teal. 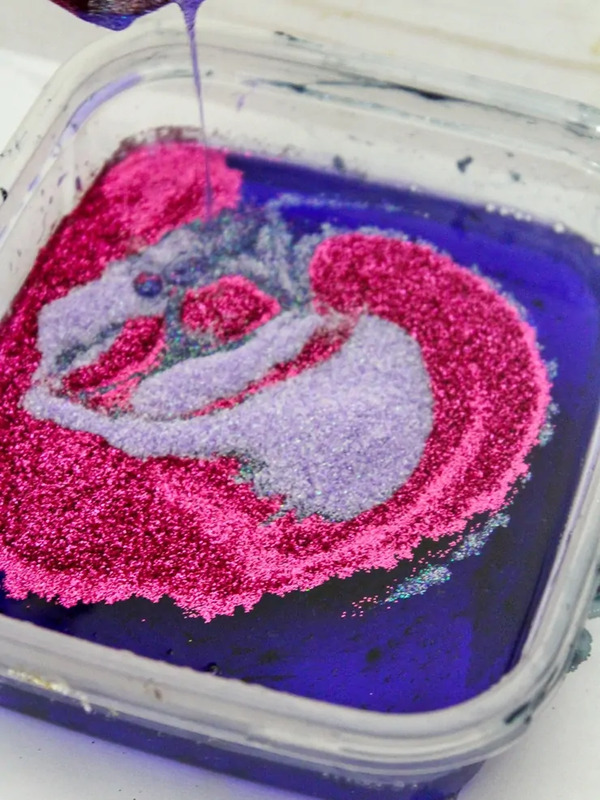 Simply repeat the process you used to make the purple slime using the teal food coloring and teal and gold glitters. Once you have made all 3 colors of slime, twist them all together for an awesome galaxy effect! What is really neat about this particular slime is that it changes its look the more that you play with it. In the beginning you can really differentiate the three different colors of slime, but the more that it is played with the more the colors combine. After playing with it for a while we added some star glitter to it as well, to give it even more of an outer-space effect. 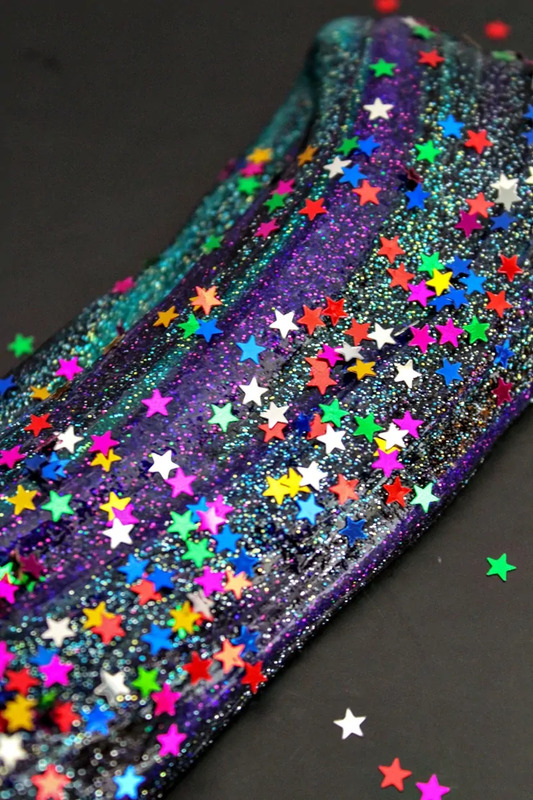 Having a galaxy themed birthday party?! 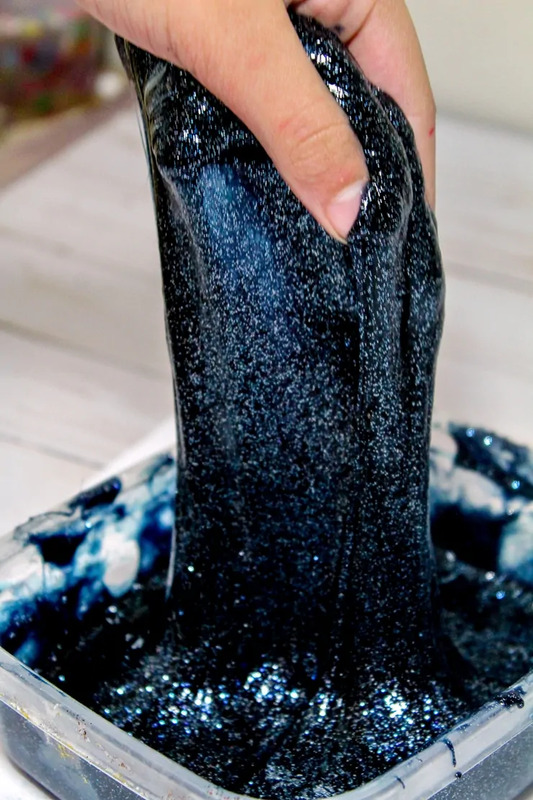 This homemade galaxy slime would make a great party favor for the kids to give their friends. 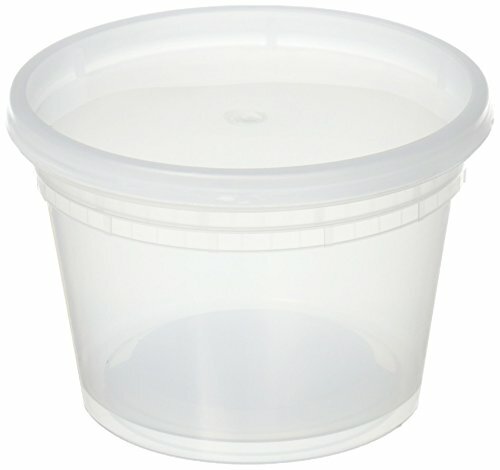 Simply place the slime in airtight containers and it will be ready to hand out. Whatever your reason for making this galactic slime with the kids, they will certainly love it. 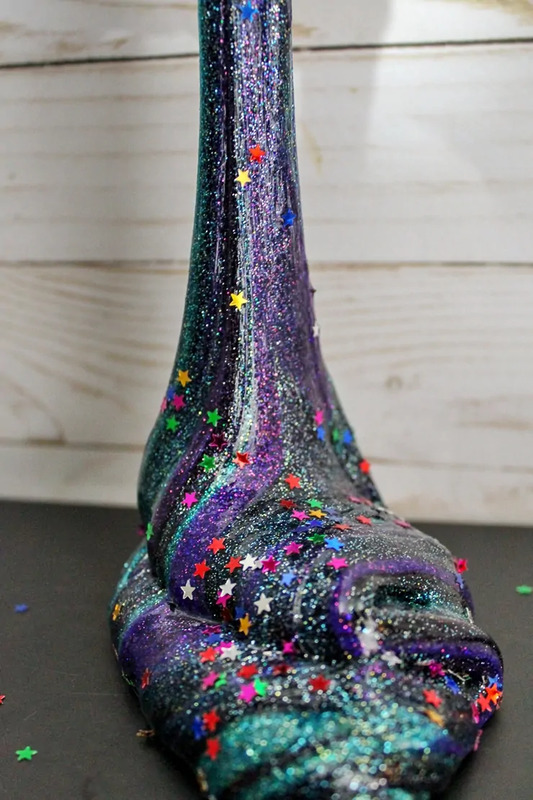 If you enjoyed this galaxy slime recipe, be sure to check out our sparkly mermaid slime, frozen slime, and under the sea slime DIY tutorials as well. They are all easy to make and a huge hit with the kiddos. 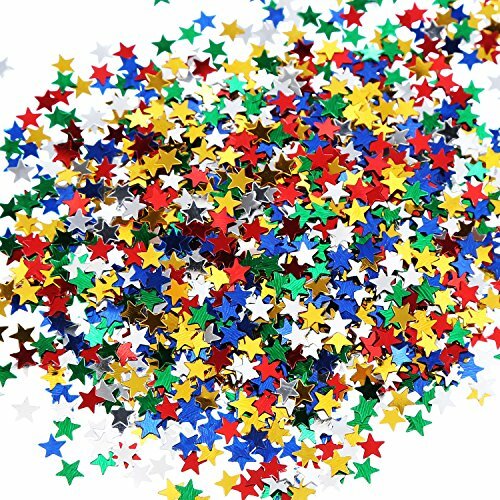 In a medium size bowl, combine entire bottle of black glitter glue, ½ cup of water, and ½ tsp baking soda. Stir. Add 1 tbsp saline solution. The slime will instantly begin to form. At this point the slime will be very sticky– but don’t panic! Continue to mix the slime in the bowl until it becomes better formed and then knead the slime until it is no longer sticky. Set the slime aside. 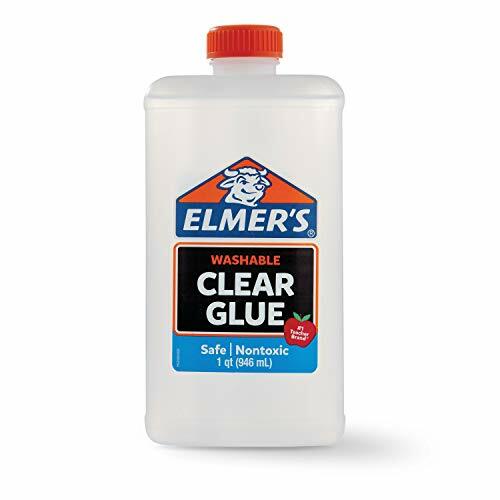 In a second bowl, combine 5 oz clear glue and 1/2 cup water, stirring until well combined. Add a few drops of purple coloring and stir. Add additional drops as necessary to achieve your desired shade. Add purple and pink glitter, stirring to mix well. 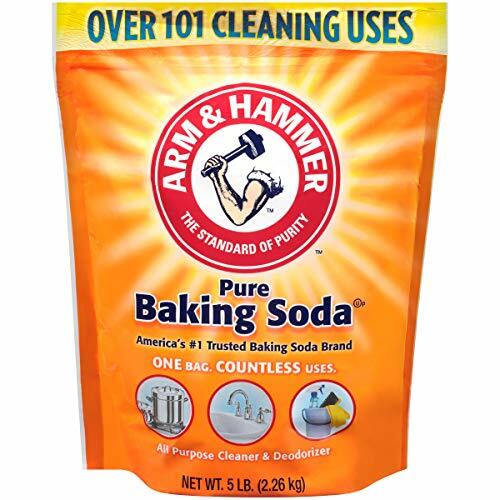 Stir in ½ tsp of baking soda. Add 1 tbsp saline solution, mixing well and then knead the slime until it isn't sticky. Set slime aside. Repeat steps 3-7 using teal food coloring and gold and teal glitters. Finally, twist all three colors of slime together. My daughter would love to make this!